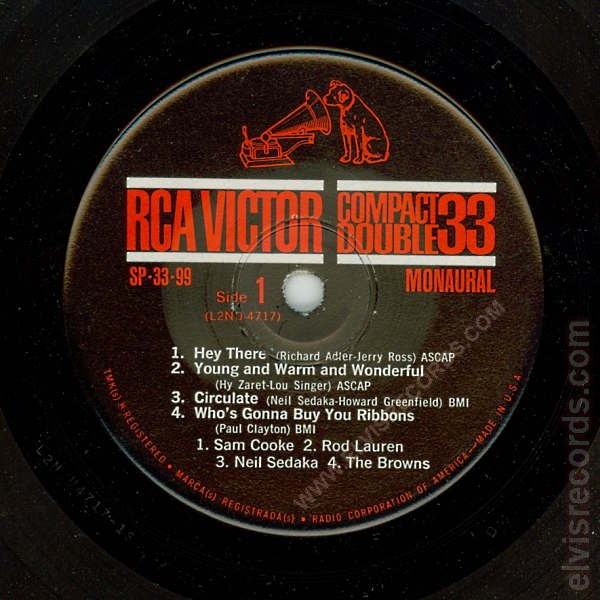 In 1960, RCA and a number of major record labels had introduced the compact 33 single in an attempt to create a one-speed format market.1 It was also a year where RCA experienced "a lackluster year with 45 RPM single sales, so January 1961 the Compact 33 RPM was to debut. The logic was that most record players offer a potential for playing 33 singles which didn't exist until a year earlier. "2 It was a move that many within the industry had thought would take two to five years3 for the market sales to switch from the 45s to the compact 33s. With a shortage of inexpensive automatic 33-speed singles players to discourage promotion of the compact 33 and the majority, of 3,000 discount stores cutting their prices of the 45 RPM from ninety-eight cents to seventy-seven cents, by 1961 the compact 33 as an industry standard was no more.1 This research is a basis for understanding the reason for the extreme values attached to artists such as Elvis Presley Compact 33 singles. RCA Victor launched their Compact 33 promotional campaign with Dr. West whom at that time was the world's largest manufacturer of toothbrushes. The initial launch would be with at least 25 Compact 33's in a Highlighter (one side monaural and the other stereo). With an initial order in the million figure, the Highlighters were to be available at over 60,000 outlets at 84 cents which include an attached toothbrush. Media promotion through Life, Seventeen, Ingenue, Playbill, Ebony, Parent's Magazine, and key newspaper markets. Dealers were to have made available a 350 Compact 33 display. The cost of this promotion was nearly $750,000 ($5,680,000 in 2012 dollars). 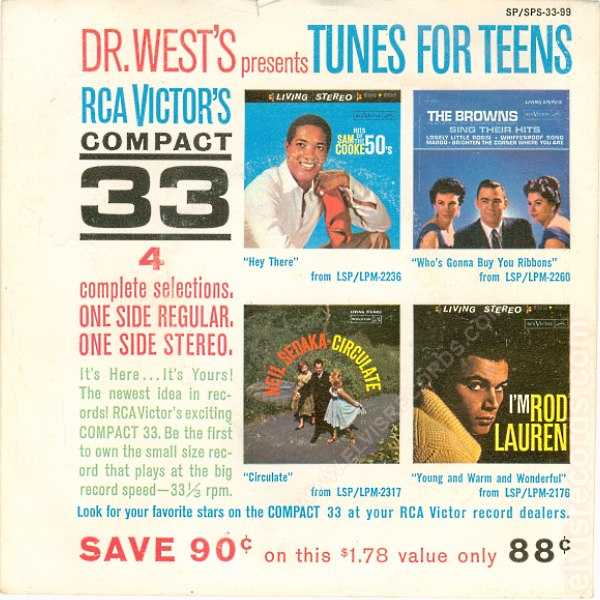 Branded as "Dr. West's presents Tundes for Teens", this highligher at 88 cents contains the following tracks: Hey There (Sam Cooke), Who's Gonna Buy You Ribbons (The Browns), Circulate (Neil Sedaka), and Young and Warm and Wonderful (Rod Lauren). 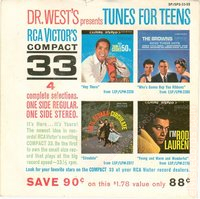 At the end of the Dr. West promotion, this Compact Double 33 was later re-issued with the $1.29 price point making no mention of Dr. West. Compact 33s are to be offered in two forms. The Compact 33 single with two songs is offered at 98 cents and the Compact 33 double with four songs offered at $1.49. 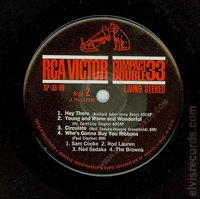 George Marek, VP and GM of RCA Victor states the company will be going "all the way" meaning "all singles product will be issued simultaneously on the Compact 33 and 45. The long-term outlook is the 33 RPM speed will eventually phase out the 45 RPM. He also stated that "with the Compact 33, a market can be created for those who like pop music but do not wish to buy or cannot afford a 12-inch LP. The new record should also be appealing to those who want to sample a new artist thru a single and then, if pleased, acquire a long playing record of that same artist." 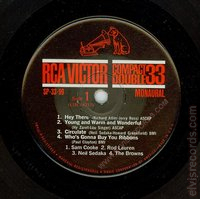 RCA Victor announces the Dramatic introduction of the Compact 33 record format. "Basic to the growth of any industry is new product. 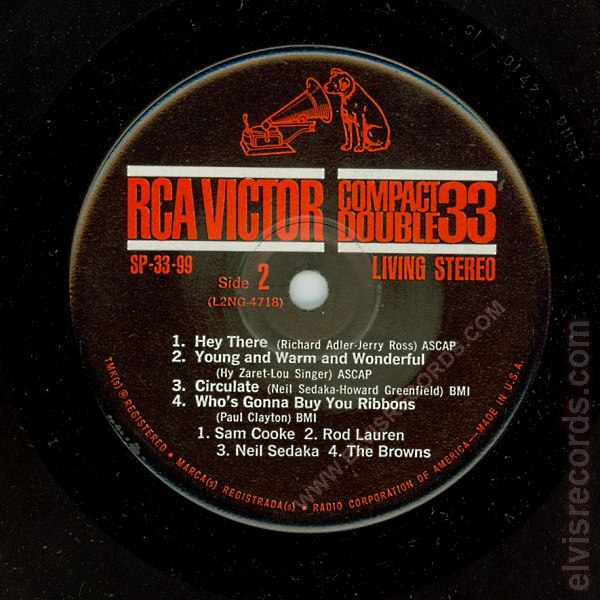 RCA Victor starts 1961 with the all-important introduction of the Compact 33 single and double. 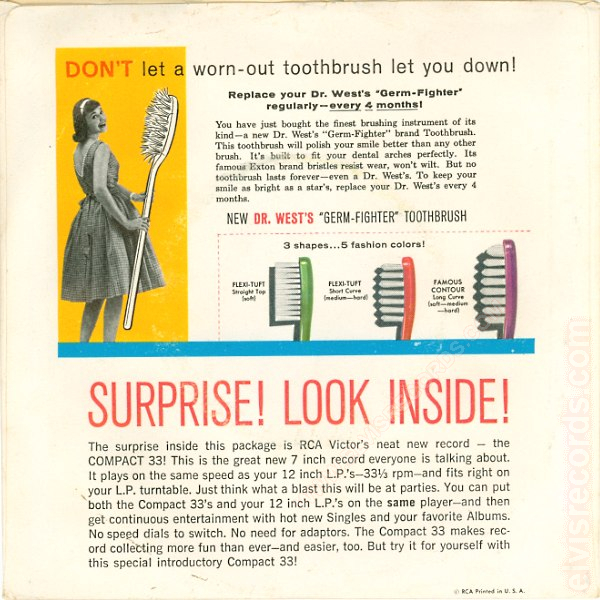 Over a million homes will be introduced to this exciting new king of record by a Special Compact 33 made for a promotional tie-in with Dr. West toothbrushes, supported by a far-reaching national advertising and promotional campaign. This pre-selling of Compact 33 will open new marketing vistas for both Popular and Classical music for the entire industry. 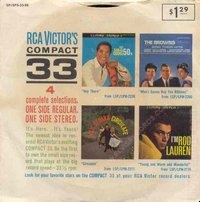 "RCA started a great press campaign for its Compact 33 ... Connie Francis singing in Spanish and Italian ..."10 The important reference to take from this statement is that RCA had hoped that since the Compact 33, particularly the double Compact 33 can hold more "data" then there could be an expansion as to what these singles hold. A more recent example of this could be taking a DVD and then "upgrading" to a Blu-Ray disc as it will not only provide you with the same entertainment as the original, now being towted as a "standard" however can expand upon the entertainment experience. The music industry did not embrace the Compact 33 format. The demise of the Compact 33, by September 1962, the Compact 33 is long discontinued and nearly forgotten.